Our Tree. Unique all in one format. Printed on 100% recycled paper. Featured in Nature's Green. Custom color(s) welcome. Matching reception cards, programs, menus, & thank you cards are also available. 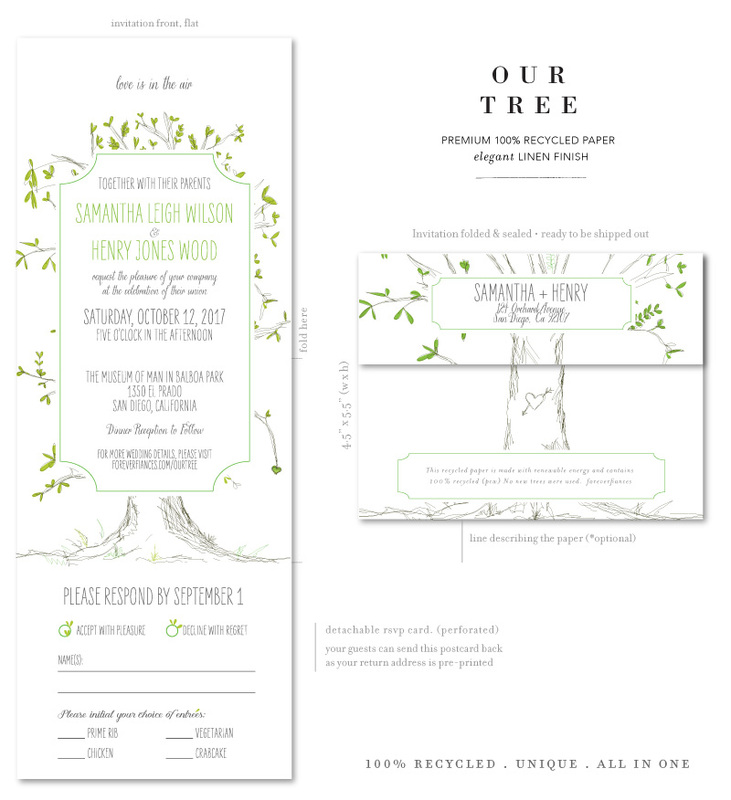 Clear eco envelopes (made from plants) are provided for the plantable all in one (Send and Sealed) invitations. Three clear tabs per invitation are provided for the non-plantable invitations. The above methods have been tested and approved as the best way to ensure proper delivery to your guests. The detachable RSVP will be returned to you as a postcard and unprotected, just as postcards are generally mailed. If this is a concern, please reach out to us for alternative options. The recommended postage for the all in one invitation should be hand-canceled. The service varies with the USPS pricing (Generally adds an extra $0.20 or sometimes free, depending to whom you talk to. You may want to ask a couple of clerks. Be sure to mention it is for you wedding). The mailing cost for the RSVP postcards is a postcard stamp. Please consult with your local USPS clerk. WOW! The process and invites turned out wonderfully. Thank you for working with us on getting the edits down. Your team was so friendly and helpful. Best wishes! My fianc Mike and I are so happy with our Wedding Invitations! They are beautiful and put together amazingly!! Ahh! I love them so much! We love how everything is in one wonderful package! And Forever Frances were amazing and helped make sure it all looked the best it could! We were so pleased with our experience with Forever Fiancs. We started with samples, which they sent promptly. They included several different options. After viewing them, we knew that these were the invitations we wanted. Once we created our invitation online, we were contacted the next day with a proof of our invitation. We made a few changes, and submitted our order. We were also able to include thank you cards at a reduced rate. We received our order earlier than expected, and our invitations were PERFECT!!!! They were exactly how we wanted them. From the minute we created our invitation, the customer service we received was exceptional. They help you thru every step of the process, and we couldn't be happier. They also include personal touches that go above and beyond what you would expect. I can't recommend them highly enough, and we would definitely use them again for any occasion that required this service. They are awesome!!!!!!!!! Shipping was very fast. A great company to work with. The digital proofs were incredibly helpful and they fully customized our cards according to my taste.